John Parker, one of New Zealand’s leading ceramic artists, has been making pottery for 50 years. A theatre set designer, too, he often stages his exhibitions theatrically. Te Uru Gallery in Titirangi, Auckland, recently held an impressive retrospective of his work that included and exciting new installation Cause and Effect. 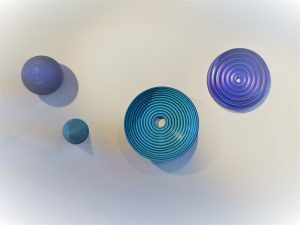 Of grooved cone shapes precariously jutting out from the wall, glazed in his signature white, his latest work takes on several new dimensions when lit. The colours change, as do the shadows, and the forms seem to alter as well. Like his previous installation Gravity, the work is displayed on a wall. Collectors can purchase the work in components and create their own installation. This large wall work is a testament to Parker’s artistic flare, his design skills and his craftsmanship. All Parker’s work is hand-made on a pottery wheel. He carefully trims or carves grooves into the clay, thus enhancing the form reflecting light and creating shadow adding another dimension. You only have to have watched The Great Pottery Throw Down on TV or tried the craft yourself to know the time this skill takes to perfect. Parker is a master of glaze technology. You won’t see him stoking the wood kiln or throwing salt into the mix. His glazes are carefully designed to produce the desired effect and are the result of careful testing and trialling. Much of his work has a modernist quality influenced by the European styles of Bauhaus rather than the more oriental approach of Bernard Leach. The lines are clean and almost geometric. Glazing is often simply black or white, but he does play with crackled surfaces and volcanic glazes. However, the simple base form does not compete but rather compliments. Parker’s work is very collectable. It is not functional in the domestic sense, but a group of his vases, or shapes either on a shelf or arranged on a wall serve as a source of pleasure. The shapes are pleasing and catch the eye. His work lends itself to contemporary interiors. This potter has definitely crossed any perceived craft/art boundaries. Parker’s work takes time to make; his mark is evident in each stage of the process. It is within this risky enterprise full of unexpected outcomes that his works produce consistently pleasing aesthetic forms. French poet Paul Valéry said the artist “takes his body with him”.